The following article is the third installment of an investigative report that demonstrates why billions of dollars are pumped into the non-profit industrial complex by corporate interests, effectively to manufacture discourse in order to protect the ruling classes from systemic change. The first installment outlined the key players: Barack Obama, Hillary and Bill Clinton, Warren Buffett, the Rockefeller family, Bill Gates, and Bill Ackman. The key instruments employed by the state and the oligarchs were/are a cluster of foundation-financed NGOs. These included/include Greenpeace, Sierra Club, NRDC and others, with 350.org/1Sky at the helm leading the cunning and strategic discourse. As reported in the first installment of this report, on November 3, 2009, Warren Buffett’s Berkshire Hathaway would purchase BNSF for $44 billion. The acquisition, approved by both boards of both corporations was approved by BNSF shareholders on February 12, 2010. Sadly, the far-right is far more interested than the “progressive greens,” and climate justice activists themselves, in the motives behind U.S. foundations funnelling millions of dollars in funding to further promote all energies and focus on the Tar Sands campaign: a campaign that concentrates almost exclusively on the Keystone extension while oil via rail, expedited pipeline projects and fracking continues to skyrocket. The far-right has taken note. Finance/markets and investors have certainly taken note. The only crowd that seems most disinterested in understanding, let alone acknowledging, the millions of dollars being funneled into this campaign are the organizations/activists beholden to 350.org et al – who are in turn, beholden to their funders. If we revisit Part I of this investigative report, the condensed timeline may assist in establishing why we see the funding increasingly markedly after 2007. · June 25, 2006: Buffett pledged to donate most of his wealth to the foundation established by Microsoft Corp. co-founder Bill Gates and his wife, Melinda Gates, as well as other “philanthropic” organizations. · 2007: Warren Buffett’s Berkshire Hathaway begins to acquire the Burlington Northern Santa Fe railroad stock. · 2007: 60% of Marmon Holdings (Union Tank Car Co.) was acquired by Buffett’s Berkshire Hathaway, with the remaining 40% to be acquired in the next five to seven years. · Aug 19, 2008: Warren Buffett and Bill Gates make a quiet visit to the Alberta tar sands. · Sept 19, 2008: TransCanada submits application to State Department for a Presidential Permit for the Keystone XL tar sands pipeline. The State Department commences the environmental review process. · Feb 2009: Thousands of citizens, including many who live along the pipeline route, express to the State Department serious concerns about the proposal in public hearings and in written comments. · August 2009: U.S. State Department approves the Enbridge’s Alberta Clipper Pipeline, a key tar sands pipeline. 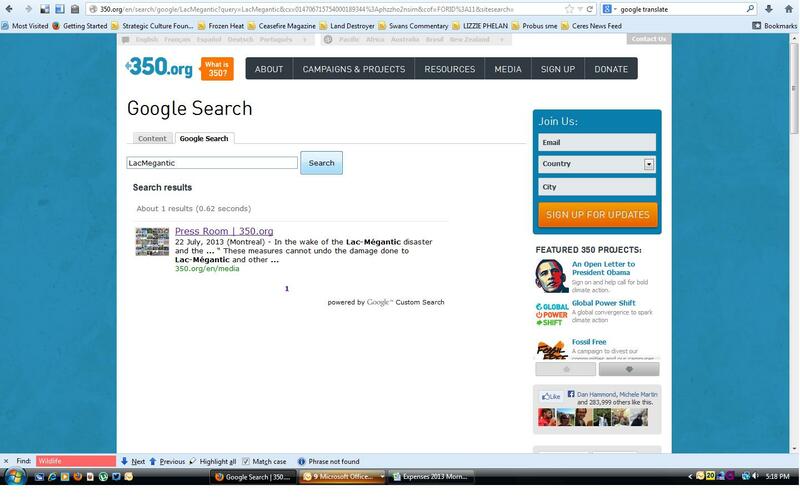 350.org et al are silent. · Nov 3, 2009: Warren Buffett’s Berkshire Hathaway proposes to purchase BNSF Railway as a wholly owned subsidiary for $44 billion in the largest deal in Berkshire history. As of June 2009, Berkshire Hathaway was the 18th largest corporation on Earth. · Feb 4, 2010: 86 U.S. organizations call on President Obama to reject the Keystone pipeline extension. 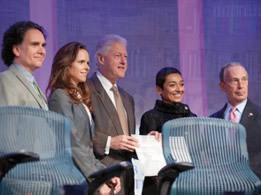 Photo: Peter and Julie Buffett with former U.S. president, Bill Clinton at the Clinton Global Initiative. What the environmental “movement” does not wish to acknowledge is the fact that the Clintons were integral to the creation of 1Sky (1Sky/350.org) as were the Rockefellers. In the Rockefeller Family Fund 2007 annual report, it is clear that 1Sky is an actual Rockefeller-initiated NGO. Such incubator projects are common within powerful foundations, although the public has little knowledge of such practices. 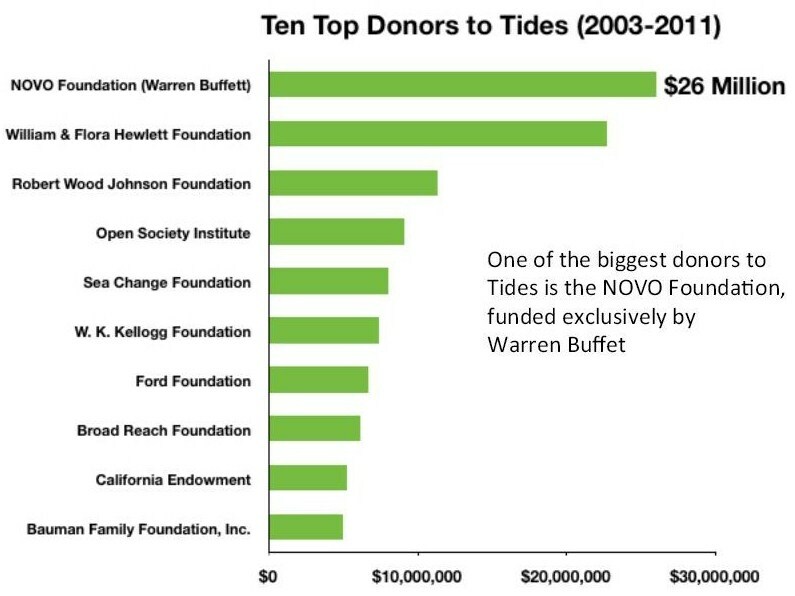 Peter Buffett, musician and youngest son of investor, Warren Buffett, along with his spouse (who serves as president), are the founders and co-chairs of the NoVo Foundation. NoVo was created in 2006 after Warren Buffett pledged to donate 350,000 shares of Berkshire Hathaway Inc. stock to the foundation (value approximately U.S. $2.5 billion). 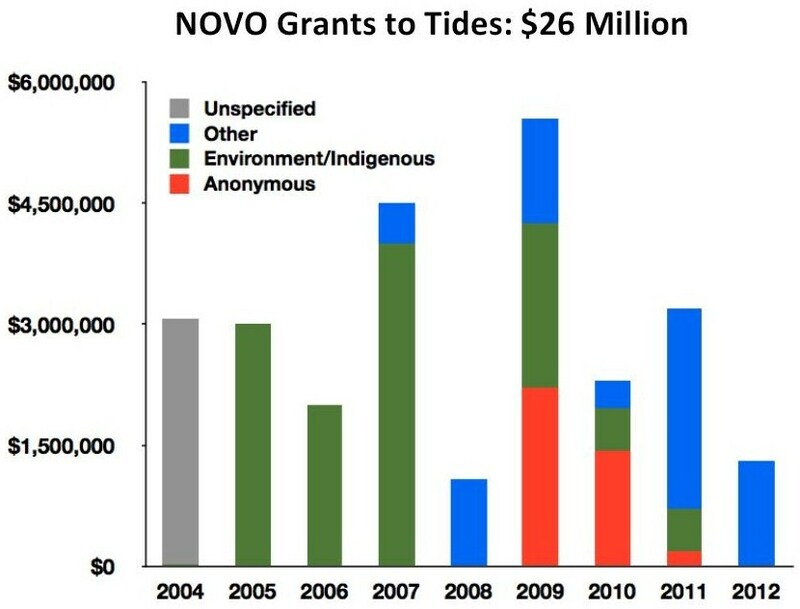 [Source] As the charts below demonstrate, NoVo Foundation is (as of 2011), the top donor to Tides in the timeframe outlined. [Source:  Prior to being unveiled as NoVo, Peter Buffett’s foundation was recognized as The Spirit Foundation which was established in 1999 (#EI-0824753). The expression/noun, elitism, fits seamlessly, like a velvet glove, within the context of the above statement. Bill McKibben and Peter Buffet headlined the weekend conference (Strategies for a New Economy Conference). The entire press release reads like a list of “who’s who” in the world of elitist, classist, green bourgeoisie. The relationship between McKibben, the Ceres affiliates and the oligarchs they serve is laid bare for all to see, with Bill McKibben featured with Warren Buffett’s son, Peter Buffett. Let us be clear, neither the Ceres “society” nor Bob Massie chose Buffett’s name from a hat nor did Buffett fall from the (1)Sky. These are extremely interconnected, well-established relationships with strong alliances and loyalties bound together by privilege, philanthropy, and whiteness. In 2012, Buffett acquired Media General, owner of 63 newspapers in the south-eastern United States. This purchase represented the second media purchase by Buffett in one year. Buffet continued media acquisitions into 2013. It is also critical to note that Buffett joined his close friend and confidant, Bill Gates (the number one shareholder in CN Rail), in investing heavily in Deere & Company–the globe’s largest manufacturer of farm equipment.Gates, who became the largest shareholder in Deere in August of 2011, has been actively pumping millions of dollars into GMO research via his foundation as well as owning shares in Monsanto. [The Bill and Melinda Gates Foundation purchased 500,000 shares in Monsanto in 2010. The shares are valued at more than $23 million. On July 15, 2012, the UK Daily Mail reports: “British scientists have won a £6.4million grant from Microsoft billionaire Bill Gates to develop genetically modified crops. The Gates Foundation’s donation is one of the largest single investments to the GM project in the UK.”] The interest in industrialized farming-related stocks shared by both Gates and Buffett (and facilitated by the World Bank and Wall Street) perhaps signal the accelerating land grabs as leading GHG-emitting states and corporations attempt to secure/steal agricultural lands and limited natural resources for a growing population on a decimated planet. The North American Indigenous Peoples Caucus (NAIPC) met on March 1, 2 and 3, 2013 in the traditional territory of the Kumeyaay Nation. The meeting was attended by approximately 97 representatives from 54 Indigenous Peoples’ Nations and organizations. · The NAIPC recommends that the Outcome Document acknowledge water as a critical element for cultural, physical, and spiritual survival. · The NAIPC recommends that the Outcome Document take a position against Aquacide: the killing of the waters by dams, diversions, privatization, deprivations, extractive industrial and mega-agricultural developments, hydraulic-fracturing, toxins, and pollution, and other ways that inhibit or preclude Water’s ability to nurture and support Life. This includes working to immediately halt Aquicide by all forms of exploitation, commodification, and other assaults that impede or destroy the life giving quality of Water. In stark contrast to such demonstrated wisdom and intelligence, the privileged Euro-American patriarchal male tends to not think in terms of respect for our Earth and shared environment that graciously sustains all life…. Yet, the stark contrast to wisdom and leadership demonstrated by Indigenous Peoples throughout America and the world, does not limit itself to the privileged Euro-American patriarchal male that dominates the capitalist system. One only has to look at the Tar Sands Solutions Network twitter feed to see who this network (registered to the queen green capitalist, Tzeporah Berman, Forest Ethics) looks to for “leadership” (read from bottom, to view the first chosen/key alliances). 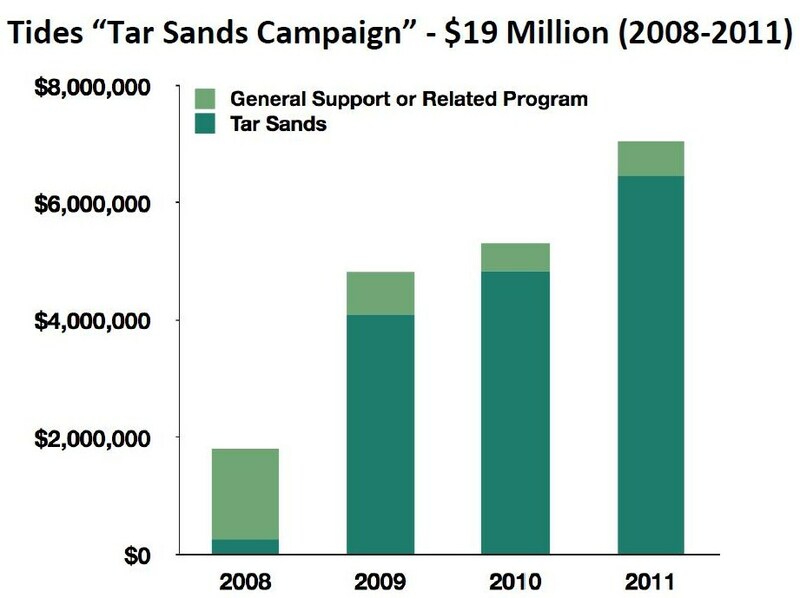 In spite of the rhetoric put forward by Tar Sands Solutions Network claiming “Tar Sands Solutions Network is a growing international network of organizations including First Nations, environmental groups, landowners, farmers, scientists, community leaders, academics, and grass roots groups located throughout North America and Europe,” the facts speak otherwise. The “solutions” network follows (literally, in all senses of the word) organizations and professional elites that undermine our justice movements from within. The most critical aspect to note is this: Although Indigenous populations are the most impacted by tar sands projects and although Indigenous Peoples have the knowledge and insight to lead us away from global omnicide, there is but one single Indigenous organization being followed by the Tar Sands Solutions Network initial twitter account. (There is one individual Indigenous person – but elitist, groomed, Rockwood Alumni does not truly qualify. No Indigenous, no landowners, no scientists. In order of first added: Pembina Institute, Sierra Club, Dogwood Initiative, Earthworks, Forest Ethics, Friends of the Earth U.S., Greenpeace USA, Honor the Earth, NRDC and RAN with CERES following closely.) On the secondary twitter account, we see a similar pattern (again, from bottom, first chosen, the top big green groups include David Suzuki Foundation, Sierra Club, NRDC, Greenpeace, National Wildlife Federation, Bill McKibben, Centre for Biodiversity, WWF, Climate Reality, 350.org and Nature Conservancy, Greenpeace USA, Conservation International, RAN, WWF, Tzeporah Berman, etc.). The crème de la crème of the big green NGOs and liberal left with not one single Indigenous organization or citizen. [Information on both twitter accounts accessed on September 19, 2013.] Note that Dirty Oil Sands has been rebranded to Tar Sands Solutions Network. It appears that there is no disclosure regarding funding/financing from the Tides Foundation, or any other source, on the site. Buffet’s Berkshire Hathaway’s extensive holdings include the corporate entities ConocoPhillips, ExxonMobil, and General Electric – all with close ties to the Alberta tar sands. In the world of capitalism even death and environmental degradation transcend into insurmountable monetary wealth for the world’s leading psychopaths. “General Electric Water & Process Technologies” stands to gain vast amounts of profit by treating immense amounts of fresh water, which is made toxic/contaminated during the tar sands procurement process. It is of interest that in late 2012 Buffett sold most of his stocks in GE. [Nov 14, 2012, Buffett’s Berkshire Sells Most of J&J and GE Stakes: “The warrants and high interest rates he was able to garner by lending money to General Electric (GE), Bank of America (BAC) and Goldman Sachs (GS) in the depths of the financial crisis are great examples of this investing strategy.”] At this same time Buffett increased his shares in National Oilwell Varco by 47%. National Oilwell Varco is a worldwide leader in providing major mechanical components for land and offshore drilling rigs. As profitable as it is to capitalize on the poisoning/degradation of Earth’s fresh water, it appears the oil industry that destroys the fresh water is too lucrative to not make first priority. The rail car industry will soon enough finish building the 40,000 oil tankers ordered/required for the tar sands oil. (Growth in crude by rail (CBR) has been rapid, creating a two-year backlog on deliveries of new tank cars.) To accommodate the high pressure loading of the Bakken oil, the oil must be kept thin. For this they need warmers (breakout tanks/oil storage facilities). The specialized heating equipment is used to heat the crude prior to unloading, meaning more crude is shipped and the cost of diluent is saved. 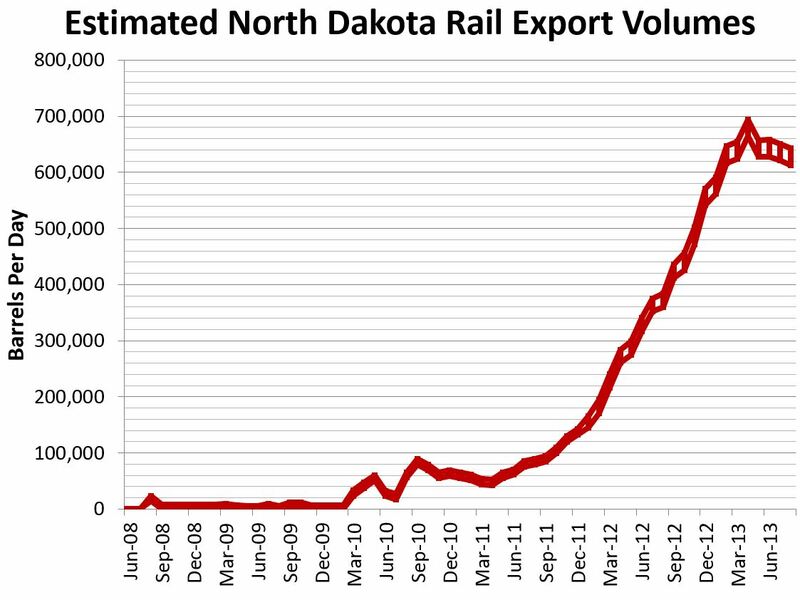 In the September 27, 2013 article A Stronger Network, With More Capacity, How BNSF is leveraging a record $4.3 billion in capital investment, it is reported that “[T]hese capacity improvements will improve service to pipeline operators and short lines, which have built 12 terminals adjacent to BNSF and Canadian Pacific infrastructure in northwestern North Dakota in the past two years, increasing the number of terminals to 16. These terminals are handling crude delivered by truck or pipelines, and according to the North Dakota Pipeline Authority, terminal capacity has increased to 730,000 barrels per day since they were built.” North Dakota produced an average of 821,431 barrels per day in June of 2013. This amount is set to double by 2017. BNSF announced in September of 2012 that it would be increasing train sizes from 100 to 104 tank cars and in some cases up to 118 tank cars. 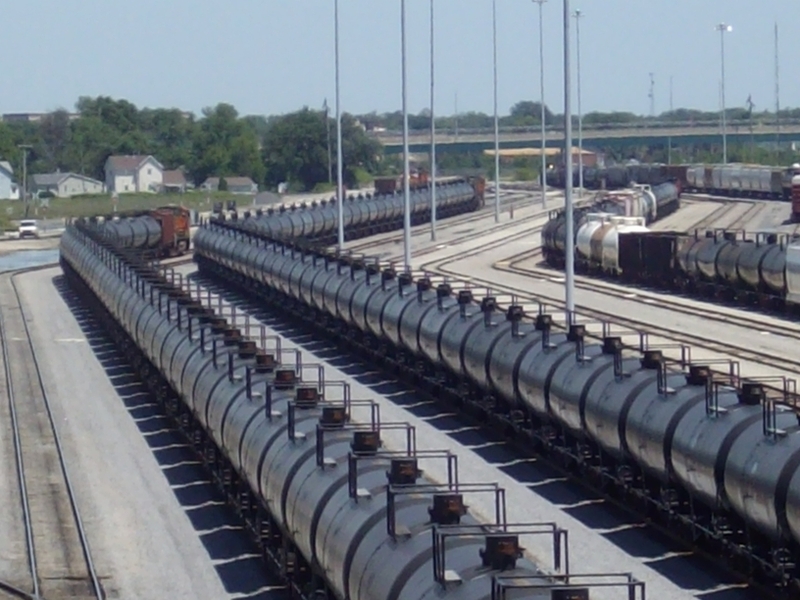 [Source:BNSF] A single tank car carries approximately 660-720 barrels of crude oil. [Source:BNSF] Therefore, 118 tank cars carrying 720 barrels of crude represents 84,960 barrels of oil. Simply put, a mere 10 trains at optimal performance would exceed Keystone XL’s carrying capacity (which is 830,000 barrels per day). On September 4, 2012 BNSF announced that it increased capacity in 2012 to enable the railroad to haul one million barrels per day out of the Williston Basin in North Dakota and Montana. Translation: Rail tank cars = $$$. Terminals = $$$. Rail track = $$$ in subsidies. Chemical diluents = $$$. All of the above = planetary ecocide, and slow-scale genocide. 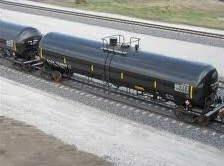 The fact that an increasing number of refineries are opting to own or lease these rail tank cars, rather than leaving it to rail corporations, speaks to the anticipated exponential growth. For example, Valero Energy Corp (VLO) announced on January 15, 2013 that they intend to purchase an additional 2,000 railcars, which will bring its current fleet of rail tank cars to 9,000 in order to haul even more of the prolificEagle Ford crudeto its refineries. [Bloomberg, August 22, 2013, Eagle Ford Crude Production Rose 60% in June from Prior Year]. As disclosed in part one of this investigative report, Buffet/Berkshire Hathaway also holds shares in Valero. One thing is certain: with every gain in profits glorified and celebrated by the industrial capitalists, it is yet another day that our Earth has been savagely plundered for her natural resources – soon, beyond recognition. All pipelines spill. Like 350.org, TransCanada, et al prefer to tell citizens what citizens want to hear. TransCanada predicted the Keystone pipeline would spill once every seven years. However, the reality was that the pipeline spilled 12 times during its first year of production, exceeding 30 spills over its existence. The Keystone XL pipeline will also spill, as rail tank cars spill, and will continue to spill. Corporations could not care less because when they do spill, they will do their best to ensure the taxpayers clean it up. (All while they make billions in unsurpassed profits. All while they continue to access massive subsidies. All while some other states, such as Venezuela, whose governments actually are representative of people, rather than corporations, nationalize their resources. All while other states, already developed – in this instance, a Spanish island – work decade after decade toward a transition from fossil fuels toward zero emissions.) In many, perhaps most, instances, the corporate entity will win(monetarily) and be deemed not responsible for the ecological nightmare.Even when they “lose” by way of a large monetary financial judgement (which is pocket change compared to their quarterly profits), rarely do they ever actually pay any meaningful monetary amounts in the way of settlements. Being the psychopaths that they are, they much prefer to give their money to lawyers rather than the (in many/most cases) impoverished peoples whose lives and land they have completely destroyed beyond repair. Since acquiring former BC Rail lines in 2003 and disconnecting its locomotives’ dynamic engine brakes, CN experienced 11 derailments in 2005 alone. More train wrecks have followed. [Source] Between 1999 and 2010, Enbridge Corp. acknowledged responsibility for 804 spills, releasing at minimum 168,645 barrels of crude oil into integral tributaries, sensitive wetlands and water tables in Canadian and U.S. communities. [Source] Case in point: on March 28, 2013, a mile-long Canadian Pacific Railway train derailed, rupturing three tankers and leaking around 15,000 gallons of fuel. Days later, on April 3, 2013, a Canadian Pacific Railway train derailed in northern Ontario. Two of about 20 derailed cars were carrying light sweet crude but remained contained. And although 350.org would have you believe they are campaigning against tar sands, what is one to make of the fact that these groups made no mention whatsoever of the apocalyptic remnants of Lac Mégantic to their “followers” / supporters. Aside from an honourable mention to 350Maine, the only reference to the most dreadful accident directly resulting from oil via rail (as of July 22, 2013), is a press release (simply titled “Over fifty groups call for tougher oil transportation safety rules”) quietly sent to media on July 22, 2013. A ban on 111A tank cars (meaning we need new or alternate models of “safe” tank cars)? A full review of “how dangerous fuels like oil and gas are transported through our communities – by train, pipeline, and truck”? After Lac Mégantic, the question must be asked, do we need a “full review” to tell us the horror just witnessed in real life? In the meantime, 350.org et al have yet to mention the approval of Keystone’s phase 3 (March 2012) and the construction that is now completed (to be operational in early 2014). [Forbes, Sept 19, 2013: “With three of the four phases of Keystone in operation or nearly complete, only one section remains.”] There is no mention of the consumptive patterns of the West that ensure every drop of oil will find its way to market. 350.org and others campaign strategically and focus on the supply side issues while the demand side is completely ignored. The anti-Keystone XL campaign “leaders” have ensured that citizens and activists alike will focus almost exclusively on the Keystone pipeline extension, even though it was publicly disclosed, as far back as January 2011, that the majority of the Keystone pipeline was already completed and in operation. If approved, the Keystone XL pipeline will transport 830,000 barrels of Canadian tar sands crude or/and the diluted bitumen (dilbit) from to refineries situated in Port Arthur, Texas, where it will be refined and sold on the global market. Yet omitted is the fact that a large portion of potential oil (approximately 25%) that would flow through the Keystone pipeline would be oil recently discovered (so we are told)in the Bakken shale formation. This formation spans North Dakota and part of Montana– the land of the Lakota Indians. (The same Lakota who are excluded from any meaningful leadership positions/senior advisory roles of the faux environmental groups.) Without the Keystone XL, the only way to get all of the Bakken oil to the refineries is by rail car. Oil production in the Bakken region has more than tripled since 2008. [Source: Bloomberg). A 2013 report by the Canadian Imperial Bank of Commerce suggests that oil production in North America is on track to grow at an “incredible rate” of 800,000 barrels per day, per year, through 2016, with more than 50% of production expected to come from the U.S. Billions upon billions of dollars are being invested in the Bakken oil field (i.e., tar sands oil) yet citizens will not be advised of this fact anywhere, other than perhaps in the finance section of the Wall Street Journal, or the BNSF website itself. Increasing U.S. oil production, under the false pretense of “energy independence and self-sufficiency,” lends much ammunition to those opposed to the KXL. It is of little surprise that Buffett is working closely with Obama in the framing of a new “energy independent United States of America” while the same U.S. foundations funding the Stop the KXL! campaign aresimultaneously funding the Apollo Alliance, the Institute for America’s Future and Blue Green Alliance. All while the Obama administration continues to invade, destabilize and occupy sovereign states all over the planet in order to steal/secure Earth’s dwindling natural resources. Today, BNSF is hauling out the Bakken crude oil from North Dakota and ethanol from Nebraska (announced in 2006). All via rail. On October 31, 2012, it was announced that BNSF would purchase the Nebraska Northeastern Railway, a 120-mile line that connects Siouxland Ethanol LLC in Jackson; NEDAK Ethanol in Atkinson; and Husker Ag Inc. in Plainview. For centuries, talented magicians have absolutely depended upon ardent distraction in order to convince an enthralled audience that what they are seeing is truly real – not simply stealthy sleight of hand. As long as the major players within the non-profit industrial complex are protesting the Keystone XL, and getting paid to do so, the audience fails to consider the tar sands oil fields, Bakken oil fracking, unit oil tank trains, etc. … along with the very root causes of climate change. Pipelines require dilution of heavy tar sands crude. This requires expensive chemicals to make the crude oil flow more easily. No doubt seeing an opportunity, Buffett commenced buying BNSF stock in 2006 and continued to buy/increase stock during the following years. This enabled the railway to start transporting the diluting agents/chemicals necessary to thin the tar sands bitumen from U.S. refineries in the Gulf Coast, California and Kansas to the Canadian border (at Superior, Wisconsin; Noyes, North Dakota; Sweetgrass, Montana; and New Westminster, British Columbia) where the rail tank cars of diluents were/are then transferred to CN rail, and finally, via rail to Edmonton, for shipment to the tar sands. Industry officials claim that rail tank cars offer the single most important advantage for transporting bitumen: because of its thickness, it must be diluted with other petroleum-based chemicals in order to flow through pipelines. But, as Buffet knows full well and has understood for years, bitumen can be transported in special rail tank cars without dilution. In November 2008, mere weeks after the Gates/Buffet tar sands expedition in Alberta, Canada, BNSF’s Manager of Business Development stated the following in BNSF’s Railway Magazine: “We’ll continue moving diluents, but there is opportunity to offer rail service as an alternative to pipelines to get the bitumen blend to the refineries,” adding that for such opportunity to be effective “partnerships with the Canadian railroads” would be necessary. The rest is now history. In 2010 Buffett bought the rest of Burlington Northern Santa Fe Rail for $44 billion while Gates *increased his stake in CN and, by April of 2012, became CN’s single largest shareholder. (*By 2006 approx. $1.4 billion of Gates’ $3.4 billion portfolio was invested exclusively in CN Rail.) Gates and Buffet are considered as “thick as thieves” and often speak to the fact that they consider each other best friends. 90 Days, 90 Reasons is an initiative by Dave Eggers and Jordan Kurland who believed that “many of Obama’s voters and donors from 2008 needed to be reminded of all he has accomplished, and all he will do if given another term. They asked a wide range of cultural figures to explain why they’re voting for Obama in 2012, in the hopes that this might re-inspire the grassroots army that got Obama elected in the first place.” Bill McKibben was one such “cultural figure” they approached for an Obama endorsement. McKibben’s endorsement/statement was made approximately 45 days before the 2012 election. REASON 45: MITT ROMNEY WILL APPROVE THE PROPOSED KEYSTONE PIPELINE. In March of 2013, Obama issued an Executive Order to have the southern half of KXL built [New York Times, March 22, 2012: In Oklahoma, Obama Declares Pipeline Support]. To be clear, about six months after Obama expedited the KXL southern half, McKibben publicly stated, in order to promote/endorse him, that Obama had yet to voice an opinion on whether or not he would support the pipeline. It is not as though progressive green “leaders” have not lied in the public sphere prior to this; such political theatre is the name of the NGO game. Yet, because McKibben has been placed upon a pedestal in the balcony section of the ivory tower, it is important to point out that he clearly lied through his teeth on this one, almost as blatantly as his blatant lie told to Karyn Strickler in an interview on Climate Challenge TV when he pretended to have no idea if his “scruffy little outfit” received funding from the Rockefeller foundations. In the meantime, as we collectively wave our protest signs at the tree branches while ignoring the root cause, CO2 emissions from tar sands production continue to accelerate as the planet passes irreversible tipping points. Echoing the corporate sentiment “we can do it cheaper” will be easy for the holdings of both Buffet and Gates since corporations continually (and legally) externalize all waste, pollution and ecological damage to citizens, planet and failing ecosystems. CN, BNSF, CP and other transporters of oil will also ignore the fact that the risk of high magnitude derailments is increasing, since corporations spend no more than what is absolutely necessary in order to increase their profits in each and every quarter. The disaster at Lac Mégantic cements this fact. In addition,we must consider the age of many of the existing tracks and the massive weight of the rail tank cars as a factor in any further disasters. Like pipelines leaks and spills, deadly derailments and spills are also disasters waiting to happen – disasters that are absolutely imminent, as we have recently witnessed – and ignored, at our own peril. I would like to end this segment (part III) with a taste of delicious irony. On July 26, 2013, Peter Buffett penned a provocative opinion piece for the New York Times titled The Charitable-Industrial Complex. “Early on in our philanthropic journey, my wife and I became aware of something I started to call Philanthropic Colonialism…. Inside any important philanthropy meeting, you witness heads of state meeting with investment managers and corporate leaders. All are searching for answers with their right hand to problems that others in the room have created with their left…. “As more lives and communities are destroyed by the system that creates vast amounts of wealth for the few, the more heroic it sounds to ‘give back.’ It’s what I would call ‘conscience laundering’ – feeling better about accumulating more than any one person could possibly need to live on by sprinkling a little around as an act of charity…. “I’m really not calling for an end to capitalism; I’m calling for humanism…. “What we have is a crisis of imagination…. Yes – an absolute crisis of imagination. Although Buffett recognizes that the complex ensures that the structure of inequality be kept intact, Buffett’s own imagination will not allow him to see outside capitalism … even when he is able to understand and acknowledge many direct results of capitalism. 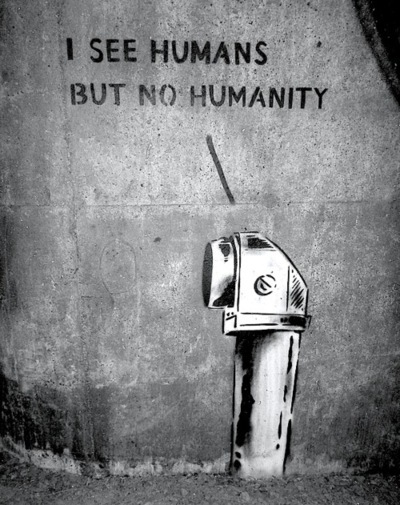 It must be understood that such a call for humanism can only be achieved by dismantling and crushing capitalism. Otherwise, we continue to wade in the blood of our brothers and sisters, all while ecosystems continue to fail and die all around us. Buffett cannot manage to cross the line to stand against capitalism. Like so many others, Buffett simply cannot bring himself to step over. Privilege blinds. Yet, there are honest and important critiques in Buffett’s opinion piece and one can be quite certain that they were not met with open arms by the white saviours who dwell within the complex. One thing is certain. Peter Buffett is far more honest than Bill McKibben. “If activists fail to address the crucial issue of liberal philanthropy now this will no doubt have dire consequences for the future of progressive activism – and democracy more generally – and it is important to recognise that liberal foundations are not all powerful and that the future, as always, lies in our hands and not theirs.” — Michael Barker, Do Capitalists Fund Revolutions? In the third quarter of 2012, 4,500 tank cars were delivered and the time for an order to be processed and the tank cars to be manufactured has now lengthened to around 15-18 months. great article. thanks for sharing this detailed information which shows growth and industrial development. I can’t help wondering how Bill McKibben, or 350.org — or any of the big anti-KXL orgs — would respond to this article. While I agree with the thrust of the article, it is a little bit deceptive to allege that a Google search only turned up one “hit”. 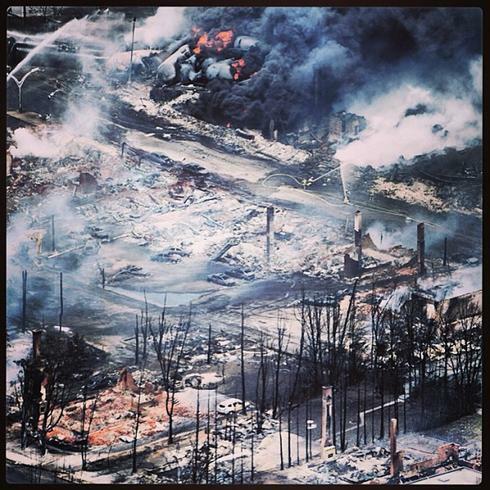 I note that the search term was “lacmegantic”, not “lac megantic” or “lac-megantic”. I know you have an axe to grind (we all do), but you need to support your claims with reason, otherwise they will not be believed. Keep up the good work and talk to the editor of this article!